This is a quick school report on Bitcoin: the Future of Money? The feedback from readers has been very nice indeed, both at Amazon and on Unbound's site too. Matt Ridley made it his book of the year in the Times. It got some very nice reviews. A beauty in the Spectator from Michael Bywater, another very nice one in Moneyweek from Dr. Matthew Partridge and, probably the best of all, from James Delingpole in the Mail on Sunday. It was also well received in the blogosphere. I particularly liked this one from Otto Rock over at IKN and this one from computer programmer, Rob Fisher. 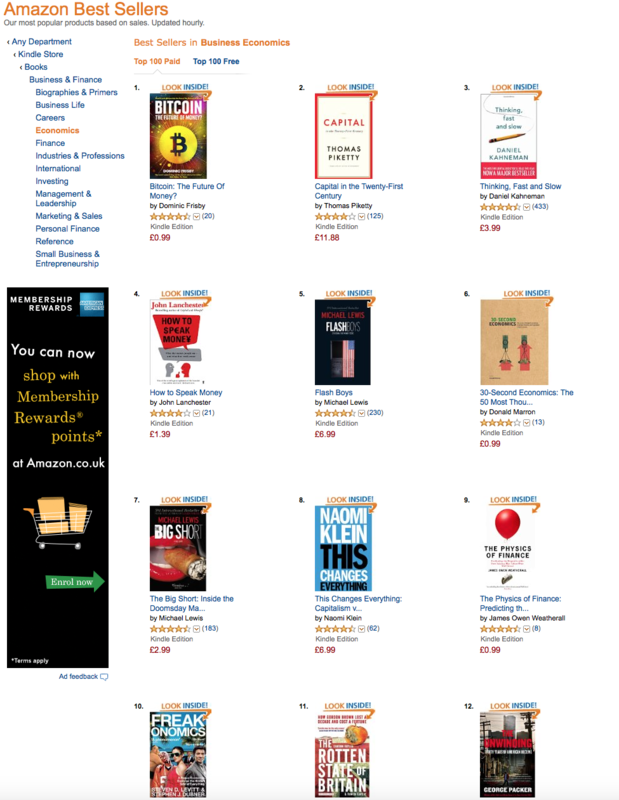 I suppose peak pleasure came on New Year’s Eve, when it pipped the economics book of 2014, Thomas Pikkety’s Capital in the 21st Century, to go top of the economics’ best-sellers. 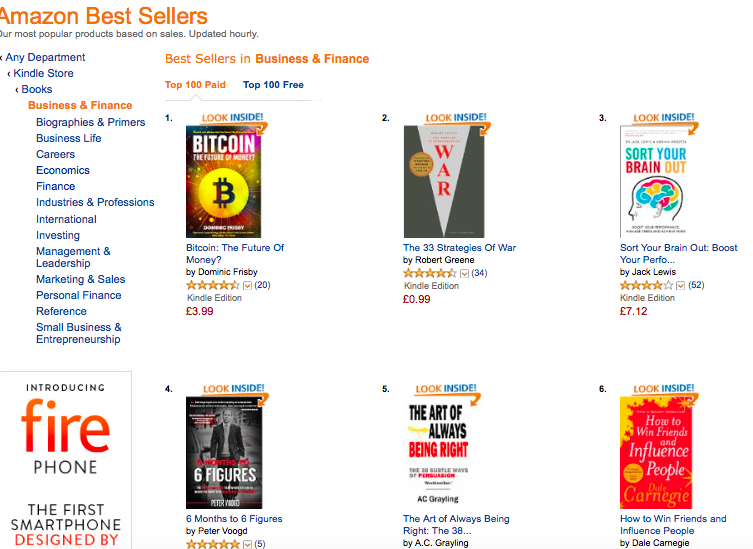 At one stage that day it even got to the top of the entire business and finance section and to number 6 in non-fiction. Not like I was watching or anything. (The explanation was that Amazon had run a promo that day, so the glory was short-lived). My biggest and probably my only stinker came from some bod in the Economist (it doesn’t say who to protect the writer’s safety). He/she didn’t even call the book by its name, but just slagged it off, quoting out of context and having a go at me for things I didn’t say. 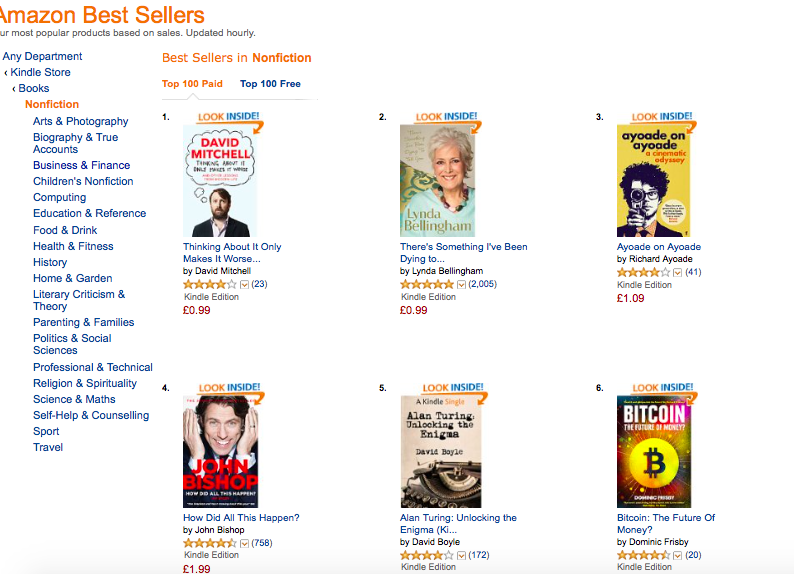 It then praised another book on Bitcoin for things I did say, before I gave up reading, out bored. God it must be frustrating being a politician, particularly Nigel Farage, as this straw-man stuff happens to them all the time. No wonder they’ve have all become so bland and beige. So there we go. It hasn’t got me on the telly, which is one of the reasons I wrote the thing, but overall it’s pretty good. The story it tells is a good one, so even if the world moves on from bitcoin, it’ll remain a good read. Thank you so much for helping to make it happen. I am extremely grateful. Apologies if this post comes across as a vanity project. It probably is. But I wanted to get a record of everything down somewhere.